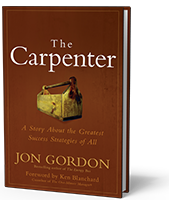 The Carpenter written by Jon Gordon, published by John Wiley & Sons. Inc., 2014. In his easy-to-read style, Jon Gordon reminds us once again that success is found in how we work and how we live. If you’re a fan of The Energy Bus, The Seed and Jon Gordon’s other books, you will love this story, too. The first chapter finds Michael hospitalized with a heart attack and the doctor asking him about stress at work. (Sound familiar?) After being ordered to take some time off, Michael meets “J”, the carpenter who helped save him when he first collapsed. Michael decides to hire the carpenter to build an entertainment center in his home. Together, they not only build an entertainment center, but they rebuild Michael’s life and business strategies. Through stories and lessons shared by the carpenter, Michael learns that real lasting success comes from putting Love, Serve, Care into practice. The focus of The Carpenter is not solely business, however. Personal relationships, teams of all kind, and one’s own attitude will surely benefit from reading this book. As he usually does, Jon uses a simple story with familiar feeling characters to draw us in and share important life truths. Note: An e-copy of this book was provided by the author. Neither the author, publisher, nor anyone else influenced or reviewed the content of this post; the opinion expressed is entirely my own.